Recently we received an update from one of our former students, Kayla Haskins. She has attended Hurricane summer programs each of the past four years and has spent her senior year building a greenhouse for her capstone project. I had the pleasure of teaching Kayla during the two week long Advanced Marine Biology program in the summer of 2017. That was Kayla’s third summer attending a Hurricane program, and I was struck by her kindness, curiosity, and gratitude. 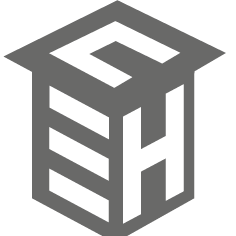 I wanted to update the Hurricane Island community of what I have been up to because I credit a lot of it to my time at Hurricane. 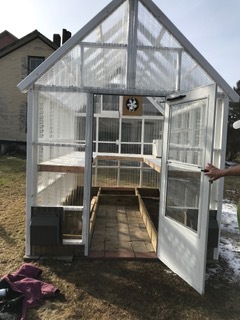 I just finished building a greenhouse for my school community. I have been designing, fundraising, and building since September. I plan on using the produce that the greenhouse provides to give free and healthier food to my school lunches as well as give to the local food bank in my town. 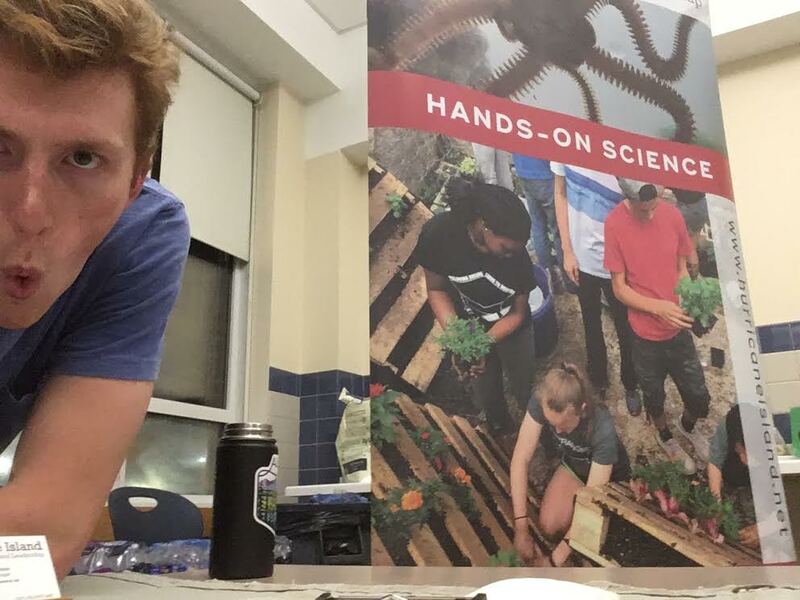 I am also using the greenhouse for future hands-on education in my school by creating a curriculum that will be used in the following years in our earth science (6th and 7th grade) and environmental science (12th grade) classes. I am also beginning to built three vertical gardens that will be hung throughout my school to provide herbs, lettuce, and improved air quality. The idea to build vertical gardens I fully credit to Hurricane Island because when I went the year before last I was able to see the environmental group go through the process of building some of their own for the benefit of the community. The greenhouse I built also with the influence of Hurricane Island because at Hurricane I was able to experience how absolutely crucial it is to have hands-on learning to impact learners to see the importance of nature and keep a lasting memory of the experience of learning. The hardest part of this project so far was the doubt I originally received. The general consensus at the beginning was that building a greenhouse was too ambitious and would require more skill, knowledge, fundraising, and time than I had. People suggested that a more reasonable goal would be to design the greenhouse blueprints, make a business plan, care for bees, or other things along those lines. It was difficult at first to have so many people against me when I had an idea I was very passionate about and knew I could do. After creating a budget and blueprints, I fundraised the money I needed thanks to the lovely community around me and good amount of strangers as well, then I asked for the help of my grandfather who had no doubts in my project at all. We started to build the greenhouse together. Although I definitely had people doubting me in the beginning I now have so many people that believe in me and my project and I feel very fortunate for that. I have received so many offers for help. I am connecting with a college professor to make a syllabus for classes next year, I was offered free soil from a local farmer who lives down the road from me, I was offered very cheap hay from another local farmer, I was able to speak with an architect who was interested in the greenhouse and looked over my original blueprints, the sustainably council at my school donated to my project without any push at all, I was able to go to a CISA (community involved sustaining agriculture) story time free of charge, and many school groups have offered to assist in planting starting this February. So getting the greenhouse project started was a little difficult but the end result just shows that when you are behind something you are passionate about amazing things can happen. This is a part of my senior project (capstone) that my school requires of each student but I did take it a bit farther than the usual project. My school was fairly excited about the idea and there was never any question about if the greenhouse could be built but just where it could be built. Besides the school board allowing me to build the greenhouse on school grounds the rest has been an independent project. The school did not provide funds, or materials, or anything of that sort but just gave me the mental and physical space I needed for being able to turn my idea into something real. This summer, Kayla will be back on Hurricane for two weeks to help us pilot our high school junior and senior internship program, and she’ll be focused on our gardens and sustainable food systems. We are thrilled to have her on the island once again! Photo of the finished greenhouse, in time for starters of kale and mesclun salad mix. Afternoon light at Kayla’s greenhouse! It’s tricky to get to Hurricane Island in the winter. It isn't a stop on the Maine State Ferry's route; the closest you can get is Carver's Harbor on Vinalhaven. Our small boats are hauled out for the season, so I reached out to a friend who fishes a 36' Beals designed lobster boat out of Vinalhaven, and happened to catch him on a day off. He kindly agreed to run me over to the island on a Sunday morning. This particular Sunday morning happened to be the first morning of daylight savings time, which I was woefully unprepared for. I rolled out of bed at quarter to six, which felt like quarter to five, dragged on some clothes, and made my way to the ferry terminal in Rockland. On my walk to the ferry from a nearby parking spot, I was met with a scene that made me forget how early it felt, and set the tone for the day. I was treated to a gorgeous sunrise, looking out on working Rockland harbor, past the Breakwater Lighthouse and on to the Fox Islands. I strolled off the ferry in Vinalhaven at 08:15, met my lobsterman friend at the locals’ favorite breakfast joint, and we headed over to the aluminum skiff at the lobster co-op. A few quick pulls on the start cord, and we were off on a short trip to the big boat, a purpose-built craft with diesel engine power. He ran through his startup procedure, and had the engine warming up in seconds. We dropped the mooring and idled out of the harbor. He slid a breakfast sandwich wrapped in wax paper in my hand. We were the only boat on the move that morning. I had been watching the wind forecast the night before. As expected, it had come around from the northwest, and was now steadily building from the southeast. It's not known exactly what Hurricane Island is named for, but it wouldn't be a stretch to attribute it to exposure to big wind and seas. If you're at all familiar with Hurricane, you'll know that a rolling sea from the southeast makes its way in through the surrounding ledges, and directly into the mooring field and Main Pier. My friend and I shared the concern that it would be easy to get me on the island now, but could be much more challenging as the wind picked up later on. We decided to go for it, but make it a quick trip. He leaned on the throttle as the engine came up to temp, and the boat got up on step as we rounded the north end of Greens Island, making the turn to shoot for Hurricane. It was a familiar sight, picking out more and more detail as we approached. We discussed the nature of the trip, and a timeline, yelling over 1200 rpm of throbbing combustion. I said I'd give a big wave when I was ready to get picked up, and he decided to hang on a mooring and wait for me to be done. He pulled up to windward of the Main Pier, and let the wind do the work, bringing us to a controlled stop against the pilings. I carefully scrambled up the ladder, tape measure, notebook, and camera in my pockets. To my surprise, there was a significant amount of snow on the ground, drifted up in places more than a foot and a half. To the mainlanders who usually can't see out their kitchen windows by March, that may seem insignificant, but the heat from the ocean water often brings little snow accumulation to the islands these days. It's more likely to see a wintery mix of rain and snow. The buildings were exactly the way I had left them in November. The only tracks were those of the island animals. Deer, mink, and raccoons are the usual suspects. I ran around collecting all the measurements I needed to plan for materials orders and repairs. I did a quick inspection of the main buildings, and found everything to be as it should. I took a spin around the south end of the island, inspecting the staff cabins and snapping a few photos as I went. Once I was satisfied that everything was more or less in order, I headed back to the Pier and flapped my arms, signaling that I was ready to fly the coop. The wind had picked up considerably, and instead of coming side-to the pier, the captain took a stern-to approach, and backed down slowly to meet me. I was perched four or five rungs above the water, ready to step on. I did so with grace and dignity, and as soon as my feet hit the deck, the boat was in gear and we were off. I am having a lot of spiritual brainstorms recently about how to talk to people about Hurricane Island. This is coming off a few days down in greater Boston recruiting students to register for our summer programs. Actually the term that we in the biz use is “tabling,” (i.e. I tabled for Hurricane this afternoon). My sister was befuddled by my use of this term. “Tabling? What is tabling? Is that like a subgenre of planking or something?” She didn’t say that, but tossing in a quote shakes up the rhythm of the writing, I’m told. I’m here to keep you on your toes (to that end, I have a goal of including a few links in this article, so check up on your cultural competency of a term I dropped 2 sentences ago). I severely digress. I spent Sunday at Phillips Academy in Andover, Monday at Newton South High School and Tuesday at Lexington High School, all in the great state of Massachusetts. The scene at each of these fairs is something to behold. Or at least it was for me, so you better believe I will relay it as such! I’ve definitely been to one before, but for whatever reason, it washed over me in a new way this time. Representatives from, let’s say, one hundred organizations trickle in to the cafeteria (or gymnasium or wherever the event is being held) about an hour and a half prior to the event’s official start time. They wheel their suitcases of materials over to the check-in table, where you are given your table number and the wifi password (educ@tion) and a map to the snack area. The organizers of these events really are crushing it. Laura Marks runs Teen Summer Expos, which hosted the latter two events. I love how singular her mission is - simply to put on these fairs that promote an array of summer opportunities for students - and how dedicated she is to it. I know it’s pretty low quality, but this selfie is all I have. This was a SOLO trip, y’all!! Soon enough, a previously bland and bare space begins to come alive. Table coverings are unfurled, banners erected, pamphlets stacked or fanned (depending on your style). Each organization curates their own little world, which, ideally, exactly embodies the spirit of the program you are promoting. Actually an interesting challenge. Each group’s table and its accoutrements are, at once, altar and portal and life-size diorama. Bear with me as I scrape the rust off my metaphor game. The result of all these carefully set up tables is somewhat overwhelming. The room is now plastered with words meant to catch your eye, images designed to entice, and people all around who have good posture and smiling faces and who really, truly, want to talk to you in a cool and chill way (really). And everyone is right next to each other, so it’s innately comparative; there’s this underpinning of competition below the congeniality. Everyone’s trying to boost themselves above the rest. So very early on, I’m like, Maybe I shouldn’t smile? And that could set me apart? This unfortunately does not come easily to me and also I decided would end up being a worse tactic, but I seriously found myself inclined to “out-chill” everyone, to somehow draw folks in by being calm and reserved. “How’s it going? I’ll tell you as much or as little as you want,” I try saying. Some people march through with an apparent grocery list, scanning for what matches their criteria. So parents they see the word “Science” they could breeze right past, or come to a grinding halt. Marine biology, check. Some approach the table and cut right to the chase, and will knowingly prompt, “go for it, what’s your spiel?” Permission to dive in! Yes! And the reality is, despite this strange feeling (which I am hyperbolizing) that I am trying to out-bid the people nearest me, there are so many options for these students that the process ends up being self-selecting. The only common denominator is that all of the programs happen during the summer. That’s it. Conversations at the Hurricane table do happen, genuine ones. Nobody who looks at the words “Sustainability” or “Field Experience” and thinks to themselves, yuck, is going to talk to me. And that’s great! They’re going to do some other wild thing with their summer. But then, the folks who think yum, or more likely, ok! end up stopping by. 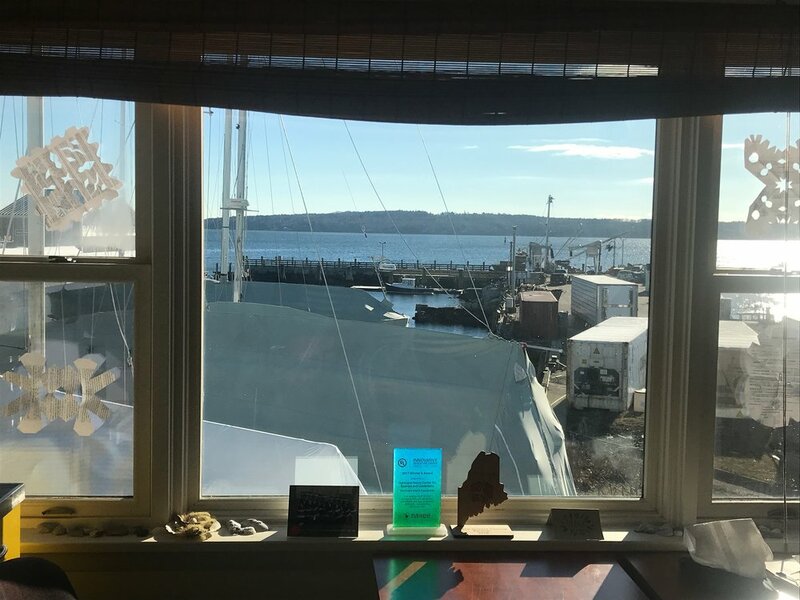 I had lovely conversations with folks who were psyched on marine biology, others who will be a part of a Hurricane school program this spring, and others still who just thought coastal Maine seemed cool. With these people, I ended up gushing about life on Hurricane Island. I tried to communicate what I know - which is that we offer really special, impactful programs. It's hard to do this in brief, but it is such a joy to remember the details of it all. A conversation that forces the specifics out of you - “there's a boat we all take together, your educator will meet you on the mainland” - really jolts you back: oh yeah, there’s the island! Remember the island? Remember walking toward the north end, after dinner, the setting sun painting the grass and spruce golden? This nostalgia has a vice grip on me now, but only after having had wonderful conversations about these programs with bright-eyed young people. How lucky we are to get to bring others to this place full of magic. Thank you for letting me process via blog post, honestly. This has genuinely been healing. It all started with an application to a joint program between Underwriters Laboratories (UL) and NAAEE. I still remember sitting in a local coffee shop for several days working on Hurricane’s application to be a UL Innovative Education Award winner and feeling such pride in where I worked and what we had been able to accomplish up to that point in our existence. Now two full years later, not only was Hurricane Island Center for Science and Leadership selected as a 2017 Tier II award winner with ULIEA, I have personally fallen down the rabbit hole and become a full fledged NAAEE groupie (complete with a profile on NAAEE’s eePRO platform and a subscription to their Imagine If podcast). While we were well on our way to having national impact previously, our involvement with NAAEE has sped up that process by leaps and bounds. One measure of that impact is through the amazing collaborative opportunities that came directly out of the connections we made through the ULIEA network. One such collaboration with the Chicago Eco House (another 2017 ULIEA winner) was highlighted on the ULIEA blog recently, outlining the work we are doing with HAWX Open Ocean and the Islseboro Central School to improve an innovative new device called a Sea Rocket. 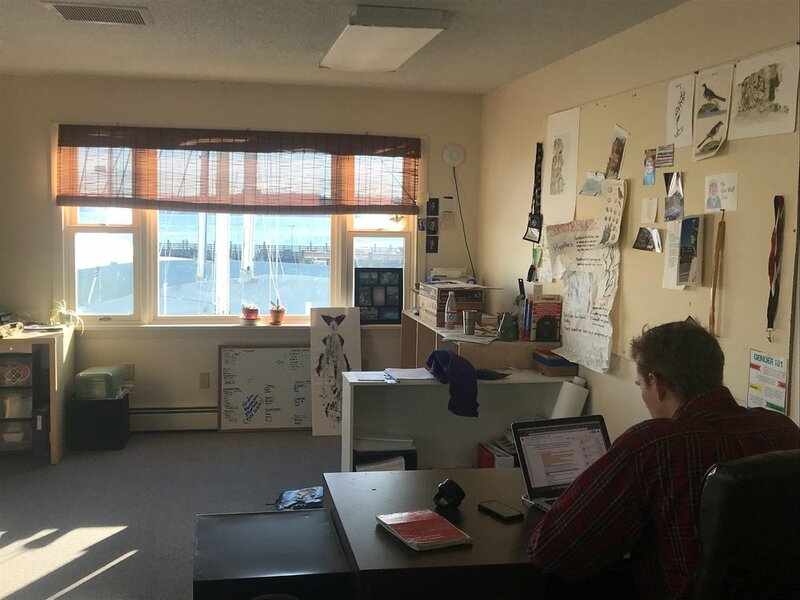 The students from both programs will be working on improving the sustainability of the device and the Islesboro students will be testing the newly engineered solutions and using the Sea Rocket to collect data in Penobscot Bay. Another collaboration is with the Women in Natural Sciences (WINS) program (2015 ULIEA winner), an amazing and intensive after school and summer science enrichment program through the Academy of Natural Sciences in Philadelphia. The young women in this program progress through two major phases, the second of which expands their career horizons and gives them experiences outside of Philadelphia. One of these young women, Nayeli Perez, came to Hurricane Island on a scholarship and wrote an amazing piece about her time on Hurricane for the most recent WINS newsletter. I teared up (and laughed out loud) reading her narrative so I highly suggest you read it yourself as an amazingly honest view of how impactful the whole experience was for her on multiple levels. Apparently not content with what we already had accomplished through our work with NAAEE, I threw my hat back in the ring in 2018 and was selected as one of 32 international ee360 Community Fellows. These fellows were selected from as far away as Nepal, New Zealand, India and China, and as close by as a fellow Mainer and everyone was joined by our desire to address environmental challenges and build community resilience. The connections with these amazing individuals has already impacted me beyond measure and I am bringing that energy and new knowledge into my work at Hurricane Island. My action project is specifically designed to support a cohort of teachers to implement place-based education projects with their own classrooms and communities, kicking off with a joint retreat this August on Hurricane Island. Hurricane continues to grow its impact and we have an incredible year round and seasonal staff that are pushing the work forward. To say that I feel privileged to work for this organization is an understatement and I similarly cannot fully express how grateful I am (and we are) to NAAEE and all the programs mentioned for recognizing the work we do and helping us to expand our reach to more individuals, more organizations, and more communities. You can be sure we will continue our work in 2019 so check back often for updates on all our endeavors and we would love to hear about any other connections you want to send our way! Exhausted. Energized. These words seem to contradict each other, yet, after full days at conferences rich with thoughtful discussion, workshops, and colleagues, I feel simultaneously exhausted and energized. Exhausted because the days are long, my mind has been actively engaged, I’ve been traveling, and I am meeting people and conversing all day. Energized because these conversations and workshops are so stimulating and inspiring, and I am invigorated thinking about all the possibilities; how will I incorporate my learnings and leverage new contacts? The Root Skills Conference earlier this month provided me exactly the combination of exhaustion and energy that I have come to expect at conferences, and the quality of the conference far exceeded my expectations. The conference, hosted annually by the New England Grassroots Environment Fund, builds equity within the environmental sector, reducing barriers for participation by offering sliding scale conference rates, free on site child care, and language translation services. The two-day conference also offers a combination of content learning and skill building, with Day 1 focusing on themes such as Land, Water, Food Systems, and Energy, while Day 2 focuses on Equity, Youth Empowerment, Resilience, and Grassroots Fundraising, for example. In my workshops, I learned about Wabanaki history in Maine, urban community gardens and health programs, and explored equity and race. I also valued the conference’s “Catalyst Conversations” each morning as a warm up hour. We talked in table groups about topics like renewable energy solutions and obstacles, and shared our own work and experiences with other conference participants. Reconstructing a map of Maine after the Wabanaki REACH workshop. I enjoyed attending with colleagues and having people to check in with throughout the two days. Hurricane Program Manager Teddy Simpson and I kept our wheels turning as we discussed some of our takeaways and impressions. We also reflected (and socialized!) with many of our environmental education colleagues from Maine, particularly through the Maine Environmental Changemakers Network. I am grateful to have learned more about the Wabanaki history of Maine and how indigenous lands were continually stolen. I value the time spent examining my own identity in the context of the environmental sector. I appreciate connecting with colleagues and impassioned changemakers of all ages. I met incredible individuals doing amazing work, and I hope to keep in touch and keep energizing each other. 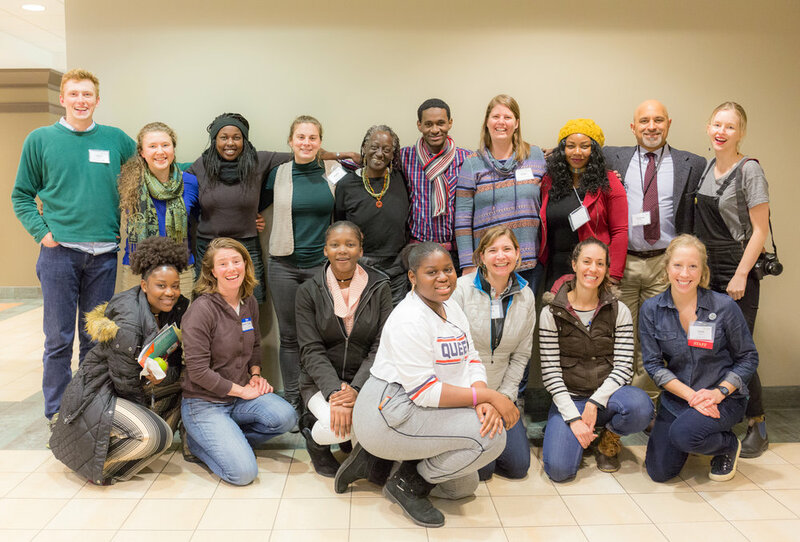 Teddy (back left), Robin (back row, fourth from left), and Maine Changemakers pause for a photo-op at the conference. Photo courtesy of Future Focus Media Co-op. Seasons, I’ve been thinking about seasons. Pretty hard not to when you live and work in a region that is ruled by the seasons, in a town that is influenced strongly by the seasons, with a waterfront that ebbs and flows with the seasonal migration of a marine species, on an island that is only open for 6 months of the year. A lot of us get asked “what do you do in the off season?” Funny thing is, there is no off season, just an off-island season :) So, here’s a little layout of what happens the rest of the year when we’re not actually on the Island. Come May, our mainland office really does clear out as most of us migrate out to the Island with the start of the season. Ask Julie, she gets nervous when all of her “chickens” leave the roost that time of year and she can’t keep tabs on us. We’ve had 2019 on the brain since the middle of the summer and start booking programs for the following year while we’re still enjoying life on the Island. Almost all of the logistical plans that make the island roll - what school is coming when with how many people – are planned this time of year. We still head out to the Island to keep tabs on our aquaculture site, the research we’re doing, and make sure that the Island stays tucked in tight through the cold and storms. We’re attending a lot of conferences for research, education, and development work and spreading the good work of who we are and what we do on Hurricane. Jenn even made it out to the Teton Science School in November! The Facilities team is scheming new sustainable ways to keep our island growing and thriving. We spend a lot of time in meetings together visioning for the future, reflecting on the season, creating new opportunities and partnerships, and enjoying working together as the creative, innovative, thoughtful, enthusiastic team that we are. Our view of the harbor. Right now the big excitement in the office is that we’re gearing up for our annual office cleaning day, followed quickly by our annual holiday party. Yes, we do a very serious clean of the mainland office once a year…is that too much?! The holiday party is always a fun time to learn about food traditions of our year-round staff, NOT talk business, and exchange gifts that are really things that we just want to unload on someone else as part of our Yankee swap. One year Sam was sad he did not walk away with a singing Taylor Swift Christmas ornament and Caitlin got a new dive tank…you just never know what you’re going to get. The first week of October was busy on Hurricane! We enjoyed lots of energy and curiosity from the 50+ Oak Hill freshmen who joined us. For the second year in a row, Maine’s Oak Hill High School has offered a freshman trip to Hurricane. 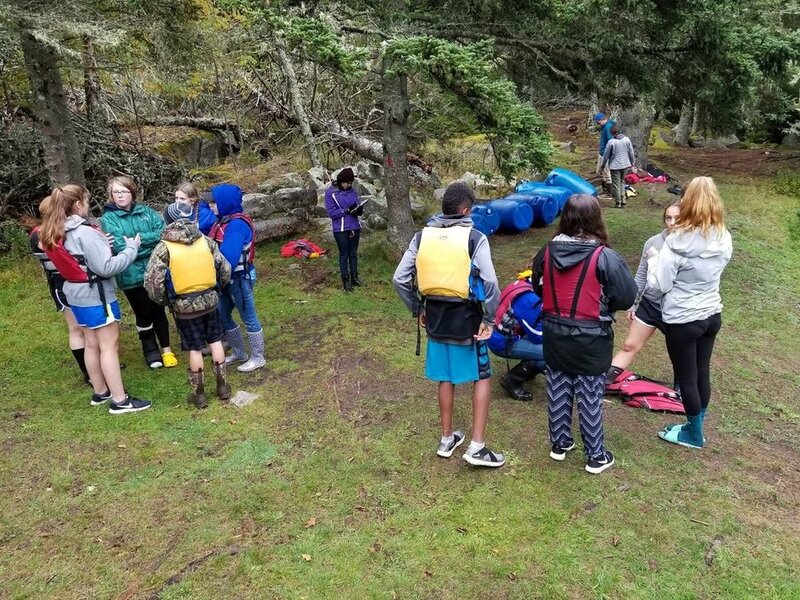 Due to a large freshman class, the students were split into two groups, visiting either Monday to Wednesday or Wednesday to Friday, and in both groups, there were students experiencing their first boat rides as we journeyed across Penobscot Bay! Chilly weather didn’t get in the way of a refreshing ocean dip! The first group experienced lots of cold and rainy weather, yet spirits remained high. Many students reflected that a highlight of the trip was our perimeter hike and sit spot at Gibbons Point - during chilly wet weather with high winds! It added a sense of adventure and common experience to the occasion. The second group enjoyed warmer, sunnier weather for activities like the raft building challenge and our exploration of the intertidal zone. Teams discuss their approaches to the raft building challenge! One of the goals of the trip was to build cohesion and community among the freshman class. Students laughed through numerous team challenges, and several students shared that by the end of the trip, they felt more comfortable around their peers, especially those outside their friend groups. They also delved into some marine science while they were on Hurricane. Investigating intertidal organisms, students unsurprisingly were excited to find crabs of varying sizes and colors. Several students sacrificed their dry pants and socks to search for urchins too. On campus, they embraced learning about aquaculture and plankton as they held our baby scallops and identified plankton under the microscope. Personally I enjoyed sharing our ocean setting with these students who spend most of their time inland. Several expressed an interest in returning, so I hope to see them back on Hurricane in 2019! An urchin under observation by Oak Hill students.